In 1912, the first year of Arizona’s statehood, rural Verde Valley was home to enterprising ranchers and farmers who raised cattle, crops ─ and children. These children needed a school. So just as they mail-ordered supplies from the Sears catalog, the community mail-ordered a teacher. Elsie Hayes, a college graduate, came from a world of concerts and literary clubs. The teacher’s tiny shack in Cornville was a far cry from her family’s lovely home in Long Beach, California. This cultured young woman drank water from an irrigation ditch, bathed in Oak Creek, and taught in a one-room schoolhouse to children first considered “common,” but with whom she soon developed a mutual love. Though she had come to Arizona feeling a bit superior to these “backwoods” folks, her emotions transformed into admiration and respect, and the untamed wilderness became “breathtaking and glorious.” IN THIS TRUE STORY, Elsie’s 100-year-old journals, photographs and detailed letters home paint a picture of a time and place that has since faded, and give insight into the early history of Cornville and Williams, Arizona. Even more than this, they are a vivid portrayal of colorful adventure, tragedy, and a heartbreaking story of lost love. “Elsie – Adventures of an Arizona Schoolteacher 1913 – 1916” by Barbara Anne Waite was recommended to me by a friend, Bernice L. Rocque, author of Until the Robin Walks on Snow (already featured on this blog) , a woman whose literary judgement I trust. This book recommendation was a good reminder why. 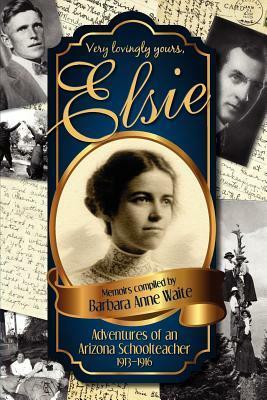 “Elsie…” is a cleverly composed annotated memoir by the granddaughter of Elsie, a Schoolteacher in Arizona 1913 – 1916. Having a soft spot for Arizona this was a double treat, as I not only got reminded of many great sights in the beautiful country but also got a chance of a well researched, documented and illustrated insight into that particular period of time in Arizona: The way of living, the type of schools, the fashion, food and clothes supply and distribution, morals and manners of the time. To make the experience even more of a pleasure, Elsie is a great object to study, her diary entries and letters show a very kind and likeable woman with an adventurous spirit. The main focus of the story seems to be her unfulfilled love affair with Karl, a local farmer four years her junior, who she falls for but with whom a liaison seems impractical and questionable. It was heart breaking to me to read about her heartache. The concept of this book is truly inspired, the author has taken great care in giving us as much insight and original documentation as possible but knew where to ‘interfere’ and write or explain the story for us directly. I am much more a fan of fiction than of biography because of the dangers that the object in question might be glorified and I had that reservation on my mind when opening the book, written by a relative of Elsie, but the author did very well in letting Elsie speak enough for herself and including her relative’s letters to ensure credibility. The writing flew so smooth and easily it was a delight to read. I agree with the overwhelming majority of the so far 202 (!) Amazon voters and award a very heartfelt 5 stars to this gem of a book. A great find for history buffs and readers interested in a good story. Please tell us a little about yourself. How long have you been writing, and how did you start? I read my Grandmother Elsie’s diary shortly after she died in 1987. I knew then I wanted to create a book from her notes, letters, diary entries and vintage photos. I loved the idea of taking what Elsie had written and adding the historical research myself. I was amazed when my letter written to the Cottonwood newspaper (asking if anyone remembered Elsie from 75 years before) resulted in 8 letters from former students. Those letters connected me to the then elderly students who had vivid memories of Elsie teaching them so many years before. That confirmed that this book needed to be written. Did you ever think of writing the story as fiction? I never considered writing it as fiction. Elsie went on to become a writer for a number of magazines and she had far more talent than I felt I had inherited. Why mess with truth preserved by the very person who lived it? How difficult was it to draw the balance between original material and annotation? I did struggle with not wanting to overwhelm the reader with too many footnotes. Yet I knew some of the numerous footnotes created (in a sense) Paul Harvey’s “the rest of the story.” So I began to take my numerous footnotes and add many of them as forwards to each chapter. I hired a man for an editor and that resulted in some interesting discussion about what needed to be “cut.” For example, he suggested it did not need to be noted that the heavy divided riding skirt Elsie asked her mother to send weighed thirty pounds. I told him that every woman needed/wanted to know that their women ancestors, in order to be “proper,” when riding horseback 100 years ago wore skirts that weighed thirty pounds. Is “Elsie” your first work? How long did it take you to write and how many rewrites did it take? I began editing Elsie’s diary in 1988 and then set it aside for a number of years. When a small publisher read some of what I had compiled and reminded me that Arizona’s Centennial was approaching in 1912 I knew it was time to get back to work. I began to refine and complete my research about a year before Elsie was published. It was published 3 months before Arizona’s Centennial. My least favorite thing was reading the manuscript over and over looking for mistakes. Did you have any say in your cover art? I hired an amazing graphic designer to do my cover and interior design. Diane King exceeded my “dream cover” wishes. I was thrilled with her compilation of photographs and letters (complete with postmark) and thought it was perfect. I wanted a handwritten font for Elsie’s diary & letters in the print version. Diane King worked with me to come up with that. I was sorry the Kindle version could not make use of that font as well. Diane was diligent to give me an interior design that matched the feel of reading someone’s letters and diary of 100 years ago. Your book has been rather successful. How did you get word out about it? Originally I had no desire to use Twitter and Facebook and all that I eventually did use in attempting to generate interest. Before I had a print copy in my hands I took a copy of the cover into one of the National Parks in Arizona to ask if they would have any interest. Their questions concerned if any of what I had compiled qualified my book as a novel. I answered that the book contained my grandmother’s edited diary & letters and my historical notes. The gentleman excitedly said, “It’s interpretive history!” I answered, “Yes sir, it is.” Between two National parks in Arizona they have purchased 520 books in less than a year. I also have about 24 other museums and gift shops in Arizona that I approached with a gift copy. Most of those chose to carry the book. One State Park buyer stopped me as I began to give him my sales pitch with, “Lady, stop- the cover ‘pops’ I’ll take a dozen!” I also offered my book Free on Kindle 6 times. Each time it resulted in a large number of sales in the weeks following the free offer. It seemed to have resulted in an increase in print sales as well. What advice would you give your fellow authors – if you can reveal your ‘secrets’ that is? I think having a website that I add historical “tidbits” to monthly has helped. I also try to personally answer each person who adds a note to my website. I have sold far more books through the twenty-four Arizona retail locations than I have through Amazon. Probably the greatest revenue has come from the Kindle sales. That saddens me, because I think novels are perfect for Kindle but a book like “Elsie” just works better as a print book, allowing a reader to go back to refer to earlier pages with greater ease. Did you find it difficult to write about real people in the past? Enough years had passed that I knew none of the people Elsie referred to were still living. The one exception to that is the newborn niece mentioned in 1915. Dorothy is now 98 years old and she read the book and enjoyed it. Were you ever worried about publishing personal details? My family all read the book and approved before it was published. Yes, when referring to actual people I think we must be careful to not dishonor their memory. What would Elsie and her family say about the book? Elsie encouraged me to write. I am sure she never imagined I might tell her story. She was still writing in her late 90’s and had considered submitting a story about her Arizona adventures to the magazine “Arizona Highways.” Elsie left handwritten notes that were never completed. I think Elsie would be both astonished and elated. I have re-read numerous books. I always have at least one book “going.” I enjoy historical fiction, biographies and memoirs. I read Jessica McCann’s “All different Kinds of Free” as I was finishing up on my book. The characters linger in my mind and I am about to re-read that book again. I loved “Cold Sassy Tree” by Olive Burns. Tell us a book you’re an evangelist for. Which author would you most like to invite to dinner, and what would you fix me? I would have loved to have met Olive Ann Burns. She had a fabulous sense of humor. Enchiladas are my favorite company meal. I would make a passion fruit cheesecake for dessert. Kindle: ”Sixteen Brides” by Stephanie Grace Whitson. I read my first one-star review with tears, but my shell is becoming harder as I have now had 200 reviews and the majority are very generous and gracious. I lived for 38 years on the 10×12 mile island of Antigua. The weird thing to me was meeting people who had never gone from one side to the other on that miniscule island. Antigua has the most gorgeous tropical waters surrounding it. I could stare at either the Atlantic or Caribbean Ocean for hours. I now live in San Diego, California and it has an amazing climate that is fabulous most all year round. I would love to see Wales, where my grandfather was born. I am working on “Elsie’s Mountain Years.” Elsie first went up Palomar Mountain when she was 16 years old in 1904 and her last trip up the mountain was when she was in her late 90’s. Elsie and her husband operated an apple ranch on Palomar from 1918-1924. Her stories about how self-sufficient they were on the apple ranch were my favorite stories she told me as a child. I might even include her recipe for squirrel and quail pie. I will not serve that to any visiting writers. I suppose I followed “somewhat” in Elsie’s footsteps in becoming an educator. I was a registered nurse, yet due to necessity became an educator. We lived outside the USA and I chose to teach our four children. I did this with almost as much “fear and trembling” as I experienced when I decided to write Elsie’s story. My oldest son eventually graduated from Harvard and has a doctorate in education from UCLA. Our daughter teaches in a University in South Korea. Elsie would be thrilled with my attempts at educating and writing. “I love and still love Arizona….” The detailed, well-crafted, handwritten manuscript did not appear to be the work of someone who was almost 97 years old. It was author and educator Elsie Reed Hayes Roberts’ final manuscript, but was a project she unfortunately never completed. A year after Elsie’s death, I discovered this manuscript nestled among her many published short stories and articles. Never before had she written anything that stirred me like this unfinished story of love and adventure in the early state of Arizona. Obviously, these three years in her early twenties had been an unforgettable time for her. While doing research I came across a tape recording Elsie had made for the Jerome Historical Society. On the tape she said in closing, “I don’t see how people who have lived in Arizona’s Verde Valley or the mountains, even briefly, can bear to live in a real city.” Elsie in fact lived in a “real city” for most of her 71 years after she left Arizona. Perhaps she lived on memories of her time in Oak Creek Canyon and Williams, memories kept fresh by re-reading her daily journals and letters to her family. I have left her letters and diary in this manuscript as she wrote them, editing out unrelated events. I used additional narrative from her cassette tapes, manuscripts, recollections by her former students, and newspaper accounts. Arizona from 1913 to 1916 was a wild and wonderful place. For those of you who enjoy a grand sense of adventure I want to give you Elsie’s memories of the fledgling state of Arizona as seen through the eyes of this delightful, spirited, young teacher. I hope you enjoy her memoirs as much as I have. I very much enjoyed this interview. Thanks, Christoph, and thanks, Barbara Anne, for sharing. Of course, I’m interested in this one. What a fascinating story, all the better that it’s true. I just have to get on to of my huge backlog. I absolutely adored Barbara’s book and this interview inspired me to read it for the third time again. Can’t wait for her next book to be published. Good luck Barbara and thanks for sharing your interview. It was my pleasure. I love meeting readers and reviews are always icing on the cake, chocolate of course!